Most of have been following along as Molly and I have read our way through early 1800’s Russia. I won’t bore you with trying to recap it all, but I will include links to all of my posts. A few last thoughts…I knew very little about what to expect and still managed to be surprised by the human drama played out in this novel. I think I called it soap opera-ish in some parts. I enjoyed the battle scenes much more than I thought I would. I love learning about strategy and history and it was told in an interesting way. Tolstoy knows how to tell a great story and he obviously did his homework for this one. I liked the book, but hated the epilogue. It really did not seem to fit with the rest of the book and could have been left out completely, mostly. It was nice to see what happened with the characters later, but even that was not told in the same way as the rest of the book. There is much to enjoy and contemplate and it is definitely worth taking a second look, at least the parts I marked and there are lots of marked up pages in my book. I was hoping to get one last picture of Max reading W & P out in the sun, but the camera battery is dead. Oh well. So, the Epilogue. Didn’t care for it the first time around, but I think it might benefit from multiple readings. Tolstoy not only tells us how things turned out for our major characters, but also his opinion of, well, everything. He gives lots to think about and maybe I’m just not in place right now where I want to put that much effort into it. Maybe it’s the glorious sun making me lazy. Before I tell you how everything turned out I need to tell you all how awesome Molly is. Molly of The Bumbles is the best! I had you guys pick a huge chunk of my reading list this year and you chose War & Peace. I whined about it and Molly offered to read it with me. Isn’t she an angel? I have not been a great partner; my posts have rarely been up on time, but Molly has carried me through. So, please visit her and see what she has to say on this last post. Natasha Rostov is a happily married woman. She marries Pierre and has lots of kids and takes delight in her family. She has changed from a spoiled, spirited girl to a woman who cares little about herself or appearance and puts all of her energy into her husband and children. There is little spark in her now. She keeps Pierre on a short leash because of her jealousy, but the two have a marriage that seems to work for both of them. I am disappointed in this final version of Natasha. I was hoping she would regain her old spirit and fire, but she has become a too content housewife. She has lost herself in the family. Princess Maria marries Nikolai after some effort on her part. The two are surprisingly well suited and I enjoyed reading about their marriage. They have lots of kids too, but somehow Maria retains Maria and this brings out the best in her husband. They are clearly in love and Nikolai respects Maria’s intelligence and moral goodness. Maria ends up in the best place. Vaska Denisov shows up visiting with both families. He’s retired but still interested in government and military affairs. He’s a bachelor and although no mention is made of it I like to think he has a woman somewhere who loves him. So, there it is. I will give rating and a complete wrap-up post tomorrow in a review that looks like one. Don’t worry it will be short. So, Molly and I have finished 1125 pages of War & Peace. The only thing left is the Epilogue and we’ll tackle that and our wrap-up next week. This week saw an end to the French occupation of Russia and my guy Vaska Denisov had a little to do with that. So, I guess I’ll start with him. One of the more palpable and advantageous deviations from the so-called rules of war is the action of scattered people against people pressed together in a mass. This kind of action always emerges in a war that acquires a national character. These actions consist in the fact that, instead of a crowd opposing a crowd, people scatter, attack singly, and flee as soon as large forces attack them, then attack as soon as the opportunity arises. Vaska Denisov had his own band of merry men and was very successful at this kind of partisan warfare. It was because of him and others like him that worked independently and together that the Russians got their country back. Prince Andrei is dead, but his death has brought his sister and ex-fiance together as BFF’s. Princess Maria Bolonsky was the first of the two women to be called out of her grief for her brother and forced to take part in the real world of being in charge of her family’s wealth and responsible for the welfare of her nephew. As she prepares to go back to Moscow the Rostov’s are dealt a blow and she sticks around to provide her support for Natasha and the family. From that day on, a passionate and tender friendship was established between Princess Maria and Natasha such as occurs only between women. Maria takes Natasha to Moscow and encourages her to live life and accept love when she finds it. Maria shines in her role as best friend. I’ve never liked her more. Still waiting to see what the future holds for her in the Epilogue. Natasha Rostov watched Andrei die, knowing she had wronged him and yet he had forgiven her. While she was still grieving for Andrei the family received the news that her youngest brother had died in battle. Natasha was devastated. Her health became so weak that her family encouraged her to travel to Moscow with Maria to consult doctors there. In Moscow, the young women grow even closer and it is Maria who is encouraging when Pierre shows up with his heart on his sleeve. Natasha’s old spark returns when Pierre looks at her with love in his eyes and she is giddy when he expresses a desire to marry her. It was nice to see the progression in Natasha and although I don’t get the Pierre attraction I’m guessing it has something to do with the way he feels about her. So, check out Molly’s take on the week and see her cat Tedy with the book. And thanks for reading along each week! Are you excited for the finale next Thursday? This week Molly and I read Part One of Volume 4. It was only 50 pages and yet we both lost one of our characters! So, Moscow is burning as the French invade, but in the high circles of society of Petersburg, life goes on as usual, with the requisite balls and social obligations. The majority of the people of that time paid no attention to the general course of things, but were guided only by the personal interests of the day. And these people were the most useful figures of that time. Those, however, who tried to understand the general course of things and wanted to take part in it with self-sacrifice and heroism, were the most useless members of society; they say everything inside out, and everything they did to be useful turned out to be useless nonsense, like Pierre’s and Mamonov’s regiments, which looted Russian villages, like the lint that young ladies plucked and that never got to the wounded, and so on. The three of my characters in this section all came together for the first and last time. Prince Andrei had been badly injured and was staying the Natasha and the Rostov’s, where his life hung in the balance. Natasha stayed by his side nursing him back to health, both of them hoping for a future together. Princess Maria, meanwhile in Voronezh, saw her true love Nikolai again and learned from him where her brother was. She and Andrei’s 7 year-old son went to him immediately (or as fast as they could which was 2 weeks). When they arrived at the monastery where the family was staying it was obvious from Natasha’s face that Andrei was not well. As the two women, past enemies, bonded over their love for Andrei they kept vigil. Andrei himself was prepared for death. By the end he had lost real meaning with his current world. “Love? What is love?” he thought. “Love hinders death. Love is life. Everything, everything I understand, I understand only because I love. Everything is, everything exists, only because I love. Everything is connected only by that. Love is God, and to die-means that I, a part of love, return to the common and eternal source.” These thoughts seemed comforting to him. But they were only thoughts. Something was lacking in them, there was something one-sidedly personal, cerebral there was no evidence. And there was the same uneasiness and vagueness. In the end Prince Andrei died and I’m sad. I thought he was a wonderful character full of life and troubled by darkness. He was a man to admire, flaws and all. So what will become of Natasha and Maria? I think Maria has a real chance at happiness with Nikolai. As for Natasha, she continued to grow up this week. She was able to redeem herself a little of her terrible treatment of Andrei when they were engaged, so maybe she’ll find happiness too. So who died over at Molly’s? You’ll have to click on over to find out. 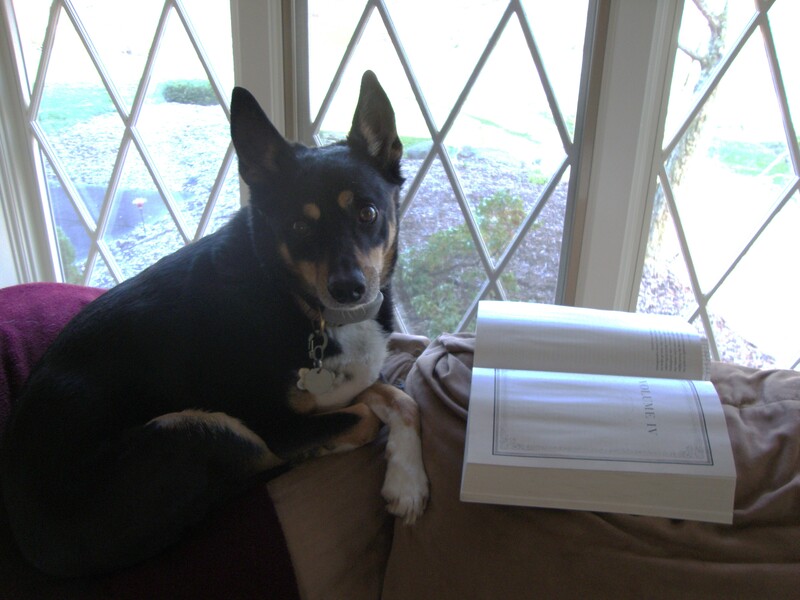 Max was back to reading this week in his favorite spot. He could keep an eye on the street and read the book too. This was an interesting week since it was primarily about Moscow preparing for the French invasion. Of my four characters only two them showed up this week, so I am also going to include a few quotes from the book so you can get a feel for the wonderful writing. Prince Andrei was presumed dead AGAIN! As the wounded are brought to Moscow we find out that he is one of them and that the doctors have little hope of him living. As luck would have it he is evacuated from Moscow with the Rostov family and when Natasha found him the connection between the two was renewed. The doctors still don’t believe he’ll recover and seem to be trying to help him stay ill.
Before discovering Andrei in their convoy she had a chance encounter with Pierre that led him to wax poetic. Now that Andrei is back in the picture it’s hard to see where that might lead. I liked Natasha more this week. She is still self-involved, but she is coming into her own and has many attractive qualities. So Moscow has been left to the French but Pierre is still there. Head on over to Molly’s to see what she has to say. She’s covering Pierre and he was a busy boy this week. We’re only a few weeks away from the end and I’m looking forward to seeing what becomes of everyone. Prince Andrei has not recovered from getting dissed by Natasha. He goes to Turkey as a general, but he’s really looking for Anatole so that he can force him into a dual over his behavior with Natasha. He doesn’t find him but does find satisfaction in being a military man once more. He is able to visit Bald Hills and gets into his first fight with his father over Maria. The next time he goes to Bald Hills it will be abandoned due to the invading French. On the eve of the battle of Borodino he meets Pierre on the battlefield and treats him cooly. He may regret that the next day as he lay dying from wounds on the battlefield. Will he live? It doesn’t look good. Princess Maria is finally getting a story of her own. Her domineering and awful father dies of a stroke when they should be leaving their land for the safer Moscow. As he dies he makes an attempt to apologize to Maria and being the most virtuous woman ever, she comforts him. As she tries to leave she makes a generous offer to the families of her brother’s land and it backfires. They hold her hostage there until Prince Nikolai, serving in the Russian army, saves her. Sparks fly between them and as she makes her way to Moscow she fancies herself in love. I have high hopes that she can flourish into a woman now that she’s on her own. Vaska Denisov is finally back, a little. He is now a hussar lieutenant colonel and he meets Andrei as they are both waiting to meet the new commander. Vaska has solid ideas for war strategy, but they are ignored. Princess Natasha after her busy time last week is recovering. She is depressed and broken-hearted, but Pierre and the church seem to awaken some of her spirit. I’m not sure of what’s brewing between her and Pierre. I just don’t get it. This week was heavy on the war and I liked it. Last week at the halfway point Jason asked me for a grade and I told him a B+, but it could easily be an A. I am really enjoying this book. Maybe next week my review will be excerpts from the book only. The storytelling is beautiful. Now go check out Molly’s take on it. She’s covering Nikolai and I wonder of what she thinks of this infactuation with Maria. No picture this week, but I encourage you to hop on over the Molly’s post where she shares the state of her book and the notes she has taken in the book. My cover isn’t as beat up, but it does look similar on the inside. This is a book just begging to be marked up. We finished Volume II this week and it was high in the drama department and it was all my Natasha’s fault, so I’ll start with her this week. Natasha is a messed-up, boy-crazy 16-year-old who I’ve liked until this week. Natasha has ‘it’, you know, that spark that certain people have that draws everyone to them. The men can’t get enough of her. Boris, Prince Andrei, and Prince Anatole all proposed marriage to the girl and even Pierre admitted his tender feelings. And as much as I hate to say it she treated them all poorly (except for Anatole, but who cares about that jerk?). She doesn’t have a self-confidence problem, but she doesn’t seem to use her brain very often. Maybe it’s the hormones and she’ll recover. I hope she does because she’s going to run out of potential husbands soon. Prince Andrei recovered from his deep depression and he became interested in military study going as far to submit his ideas to the top Russian decision makers. Though they did not accept his ideas they did appointment him the head of the Legislative Commission. He met Natasha and felt youth returning to him. So much so that he proposed. His father disapproved and Andrei decided to wait one year to marry. During that time their engagement was to remain secret. He went away to heal and when he came back a year later he found that Natasha had refused him. Maria is a tough one to understand. Her two loves are her religion and her family. At one point she had decided to becomes a religious wanderer, without home or possessions, but luckily it has not happened. She loves her brother Andrei very much and hates Natasha before they even meet. She doesn’t like the woman who will take Andrei away. When the two finally do meet the dislike is intense and mutual and she is happy when the engagement is called off. Her father is still hateful to her and has told her to move out. I think that would be the best thing for her. Vaska Denisov was nowhere to be seen this week. The only thing I learned was that Molly’s Prince Nikolai took over his regiment. I hope he’s okay. We’re at the halfway point. Thanks so much for following along with us. Now head on over to Molly’s post. The pics of her book make it worth your time. So, Max wasn’t as thrilled with the reading this week. There was some war and a duel, but he had issues when a mom died before she got to know her child. See Max doesn’t even know if his mom is still alive or where she is. He thought the story was good, but that it needed more battles. Of course, Max is a boy so that is to be expected. Molly and I read the first two parts of Volume II. We’re a little slow this week because Molly lost her grandmother and I refused to take this huge thing on vacation. But, even though it was only 120 pages a lot happened. I’m just going to cover my four people and you can check out Molly’s post as she covers the rest of the story with her four peeps. I’ve enjoyed this week’s reading more than the first two and it was action packed. Head on over to Molly’s and see what trouble Pierre and Nikolai have gotten themselves into. When Max heard that the boys were going to war this week he really wanted to be involved. So, I set up a nice little reading spot by the window and let him take it all in. He liked that there were less girly parties and gossip and more battles and strategy. Oh, and he thought it was very cool that he got to read about Napoleon, he’d heard about that dude before. Max is giving these two parts two paws up. So, this week Molly and I finished Volume I by reading Parts 2 & 3. The men went off to war to battle for Russia against the French invasion. We do take occasional visits to the Bolkonskys at Bald Hills, and the Rostovs in Moscow, but the bulk of the action is on the battlefield involving, mainly, two key players, Prince Andrei and Prince Nikolai. Vasily Denisov I finally met him. From now on I’ll call him Vaska Denisov because that’s what he’s called in the book. Here’s his physical decription…”a small man with a red face, shining black eyes, and disheveled black mustaches and hair.” He has another physical characteristic that makes him easy to identify when reading. He “swallows his r’s” so that started looks like staghrted when he talks. I don’t know much about him except that he gambles and seems to distinguish himself in battle. He’s friends with Prince Andrei. Prince Andrei Bolkonsky He wants nothing more than to distinguish himself and to impress his father, who he writes to everyday. He places himself with the right people and becomes an adjunct to the commander-in-chief. He has a hero complex but he smart, haughty, and connected so I expect him to go far. He is friends with Vaska, mixed it up with Prince Nikolai and challenged him to a fight at a later time. At the end of this volume he had been wounded and Napoleon himself had saved him from the battlefield. As the French Army leaves him with locals he is not expected to live. Princess Maria Bolkonsky Last week I said I felt sorry for her and I still do. Prince Vassily Kuragin shows up at Bald Hills with his son, Prince Anatole, and tries to make a match between the two. Much was made of her plainness and even ugliness and she grudgingly let herself hope that the handsome Prince would love her as much as she loved him at first sight. This was not to be and betrayal left Maria convinced she would never marry. Natasha Rostov We meet up with Natasha when the family receives a letter from her brother, Nikolai. She admits to Sonya that she is already forgetting her boyfriend Boris now that he has gone off to war and a comment is made that she (Natasha) has a crush on Count Pierre. Time will tell. Oh, and we found out that she is terrible at keeping secrets! I liked these two parts less than the first, but I think military or history buffs (like Max) would appreciate the battle descriptions more that I did. So, how did Molly’s characters make out? I personally think that Prince Nikola has some real issues and am unsure about this Pierre/Helene pairing. Go on over and see what she has to say. Molly and I are reading War & Peace. It may take awhile, but we’ll be posting every Thursday until we’re done. I’d love to be able to tweet the first part of Volume 1, but you are stuck with a somewhat more traditional post. 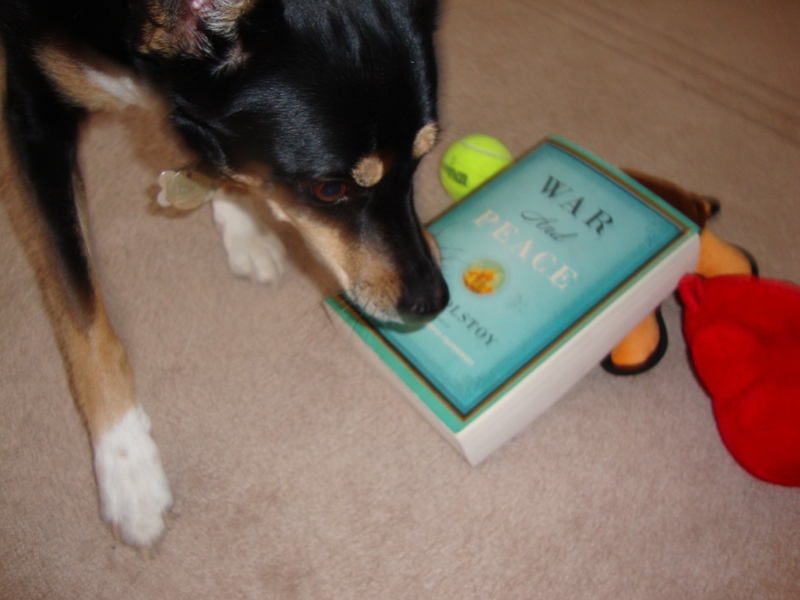 So, what’s War & Peace about anyway? Napoleon is taking over the world and it will only be a matter of time before he invades Russia. This is the story of five aristocratic Russian families during those turbulent years from 1805-1813. Who’s the main character? This is about a multitude of people, but mainly about members from five families. Here’s my scoop on the main players…Bulonskys– The Old Prince was a general in earlier wars and he has two children, Andrei and Maria. Rostovs– Loving family with four adolescent children and never enough money. Drubetskoys– Poor mother and her son. Bezukhovs– A dying count, many illegitimate children and a greedy extended family. Kuragins– They seem sketchy, but it’s too early to tell. What happens in Part 1? There’s a party in Petersburg for the titled and wealthy where we meet several key players from the Bezukhovs and Kuragins. Then we move on to Moscow to a party at the Rostovs and a death watch at the Bezukhovs. And finally we end up in Bald Hills where the Bolkonskys live and the young Prince has brought his pregnant bride. Is it boring? No! I was never bored and I was interested in all of the characters and how they all fit together. I was pleasantly surprised by how much I enjoyed it. Prince Andrei Nikolayevich Bolkonsky…We meet the little Prince at the Petersburg party where he expresses his dislike of his wife and his friendship for Pierre. Here’s his first physical description…”of medium height, a rather handsome young man with well-defined and dry features.” And this is our first taste of his personality at that party “he not only knew everyone in the drawing room, but was also so sick of them that it was very boring, the face of his pretty wife seemed to be the one he was most sick of.” He is fed up with society (and his wife), finding it empty. He takes a position in the military and on his way to war he takes his pregnant wife to his father and sister in Bald Hills. He is very unhappy, but he is smart and insightful. I like him. A little about Natasha Rostov…We meet the precocious 13-year-old at the party held in honor of her name day, which she shares with her mother. This is her first description…”dark-eyed, big-mouthed, not beautiful, but lively girl.” and this is a description her personality, “inconceivable boldness and adroitness…both smart and pert” She is in love with Boris Drubetskoy. She is charming and comes from a very close-knit and supportive family. I can’t help but like her. A very little about Princess Maria Bolkonsky… We first meet Marie when her brother brings his pregnant wife to the family estate where she lives with her overbearing father. 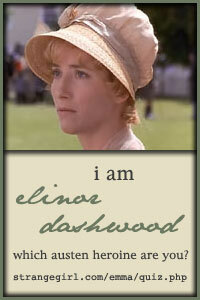 A few words that were used to describe her or her actions…timid, fearful, sickly, unattractive, sad, frightened. I know she is scared of her father, her best friend is Julie Karagin, she loves her brother, and she is very religious. I feel more sorry for her than anything, but I don’t know her very well yet. I’m having a good time with Tolstoy so far. Want to know what Molly thinks and meet the characters she’s hanging out with? Click on over… She covering overweight Pierre (seriously, it’s mentioned just as often as he is! ), jealous Sonya, handsome Prince Nikolai, and beautiful Helene.